This forum is the exclusive home to the Women’s Ministry’s Fall/Winter 2017-2018 Study on Jean-Claude Larchet’s The Theology of Illness. The study officially begins on Monday, November 6. The discussion topics below allow participants to read Thelogy of Illness on their own pace (copies are available for purchase in the Parish Bookstore), sharing insights with each other whenever time allows. This online community is moderated by Mary Lanser. 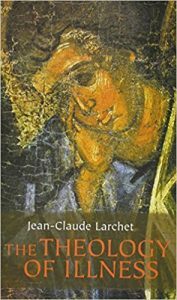 [The Theology of Illness] offers us fresh insight into the mystery of evil, sin, and illness, and their place within our struggle toward holiness… It gives us renewed hope, by locating the “problem of pain” in a profoundly theological framework, in which ultimate resolution of the mystery of illness and suffering is provided by the healing touch of Christ Himself, the Physician of our souls and bodies. Help us by determining your level of engagement to our online book study by completing this short survey.